New images show a more active surface on the Moon. The vast majority of debris moving through space and colliding with Earth burns up as it passes through the atmosphere. But our Moon has no protective atmosphere, so its surface is constantly hit by a barrage of small debris from asteroids and comets—a process that creates new craters, grinds surface rocks into a fine powder and laterally and vertically mixes the resulting layer of debris (called the regolith). We first recognized and understood the production of the lunar regolith from images returned by Ranger and Surveyor, robotic missions that flew in the 1960s. Subsequent exploration by the Apollo astronauts, along with returned lunar samples (rocks and soil), documented the rates of cratering and details of regolith production on the Moon. These studies allowed us to estimate the absolute ages of unvisited sites and to infer the likely provenance and geological significance of the returned samples. But now, as a team at Arizona State University studies new images being returned from the ongoing Lunar Reconnaissance Orbiter (LRO) mission, that history and provenance seems less well understood. Since 2009, the LRO spacecraft has been orbiting and mapping the surface of the Moon in exquisite detail. We now have multiple images (taken at widely separated times) of the same areas for large areas of the lunar surface. By identifying the appearance of a new crater on later images, we can know with a high degree of precision (from a geological perspective) when it happened. Attempting to map these craters by eyeball alone would leave us searching for a needle in a haystack, as the Moon’s surface area is about the same size as the continent of Africa. The size of impacting debris follows a power law, meaning that smaller fragments are more abundant, with the consequence that many more small craters (tens of meters in diameter) are formed than large ones. The LRO camera team designed a computer program to compare pictures taken at different times and identify newly formed craters (later verified by human examination). When an object strikes the Moon, a curtain of debris (called ejecta) is thrown out and deposited in a fairly orderly way around the circular rim of the resulting crater. The ejecta strikes the surface with high energy (no atmosphere on the Moon means no “billowing” debris cloud), often forming additional small craters called secondary impact craters (secondaries). Our understanding of this process comes from Eugene Shoemaker’s classic 1960 study of the large crater Copernicus. Shoemaker mapped the crater field around Copernicus and described how ejecta, thrown out from the primary crater during its formation, could produce this field. Secondaries are formed around craters of all sizes, becoming larger as the size of the primary increases. For the small, newly formed craters examined in the LRO study, secondaries are largely below the limits of image resolution. However, new surface debris is visible from their different surface reflectance. The new craters show striking patterns of high and low surface reflectance, manifested as ray-like zones of surface darkening or lightening over very large distances from the crater rim. These distal zones extend over a much larger area than the crater’s ejecta blanket; the markings can be found as far as 100 crater diameters away from the rim (most ejecta is confined within a single crater diameter). The authors of the new study propose that these distal zones are created during an early phase of crater formation called jetting. Jetting is the “squirting” of material from the contact point of impact; this material is mostly vapor, although some shock melt and even solid material might be included in the jets. These materials are ejected at low angles from the point of impact at high speeds (which accounts for their wide extent). Jetted vapors stir the uppermost few millimeters of the surface, inducing a change in reflectance. Although very extensive, these zones of churning are ephemeral, lasting only a few tens of thousands of years before bombardment and gardening by micrometeorites again remixes the uppermost regolith. Study of the new images suggests that, although incredibly slow by terrestrial standards, the rate of turnover and modification of the uppermost lunar surface could be as much as 100 times faster than previously believed. 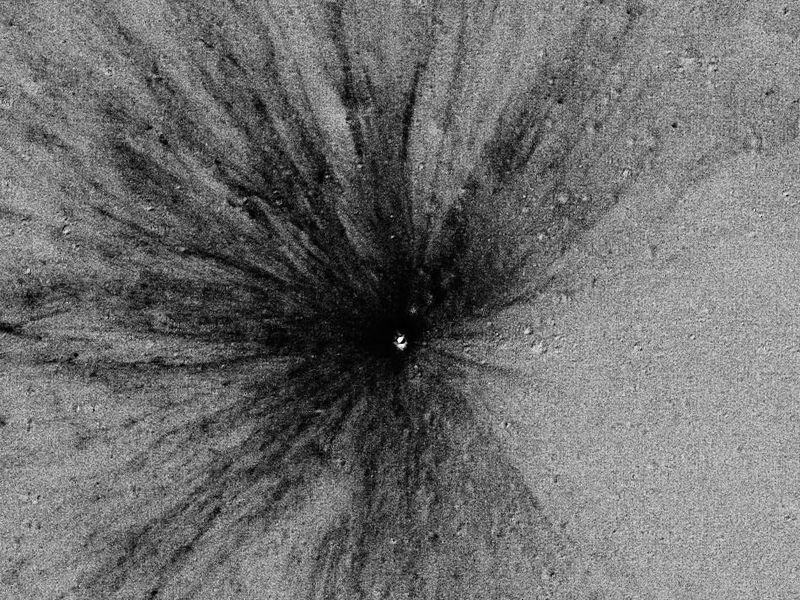 Thus, our Moon is “active” and changing—as debris from space (or from the resulting impact) strikes the Moon, high velocity vapor is blasted across the surface, scouring the upper few millimeters and leaving behind new bright and dark streaks and rays. But look quickly—such surface modification won’t last long. The continual “rain” of microscopic dust particles will quickly churn and blur the new patterns of ejecta, restoring the muted appearance of most of the lunar surface. To estimate the age of features at unvisited sites, we count the density of impact craters and compare it with sites from which we have samples dated using radiogenic isotopes. With enough data points, our estimates become increasingly more precise. The problem is that we have very few dated sites on the Moon—from returned samples, the six Apollo missions yielded age measurements of four mare lava sites and four highland sites (two missions went to combination mare-highland sites). We have especially meager information on the most recent events in lunar history, although some small craters sampled by the astronauts allow us to estimate the ages of smaller craters elsewhere. Those calibrations suggested that 12 craters greater than 10 m in diameter should form on the Moon per year; the new LRO study found a production rate of 16 per year, one-third more than predicted. Based on this new cratering rate, should we recalculate all previous age estimates? Not yet. The new number could be a statistical outlier (i.e., a fluke and a misleading occurrence) or it could reflect a new and better estimate of the real rate of impact cratering. Another possibility is that the actual cratering rate is highly variable, being lower on average over periods of millions of years, but highly variable and changing on shorter timescales. To answer this question definitively, we need much more data, especially samples of geological units on the Moon at the younger end of the timescale. By combining such results with direct observations of craters forming and/or having formed between the times the different images were taken, we can ultimately resolve this issue. And lest you think this an esoteric debate confined to students of lunar science, you might consider that the cratering timescale of the Moon is used to estimate the surface age of different features on all the terrestrial planets.